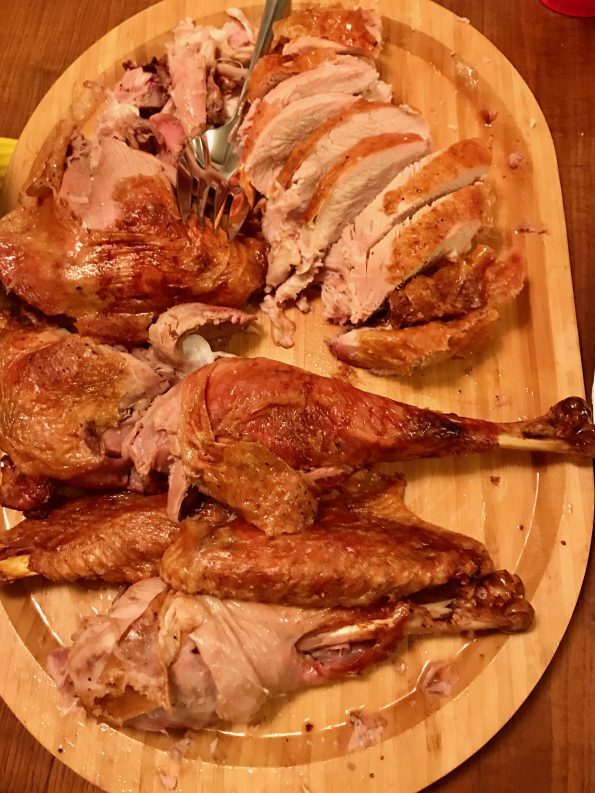 Imagine a Thanksgiving turkey with crispy skin, succulent meat, cooked fast, and easy to cleanup? THIS IS THAT RECIPE. 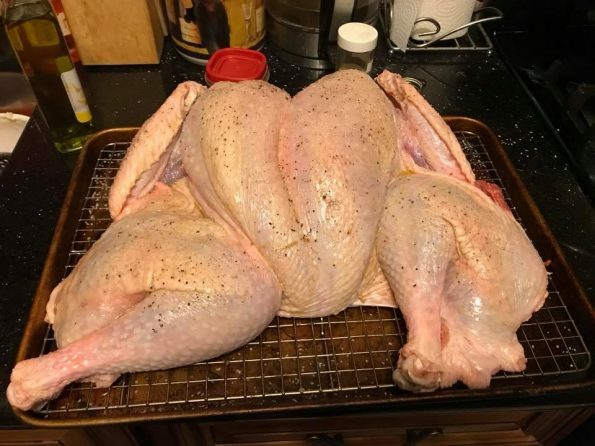 Spatchcock. That is the new word of the day. Spatchcocking means to cut out the backbone and lay the bird flat – can be any bird – and it cooks in a gloriously short amount of time with the crispiest skin imaginable. I’ve been thinking about this for months, was going to do a post on it over the summer, but was delayed after having thumb surgery, which caused me to not have any strength (who knew thumb strength was a thing?) and wouldn’t have been able to maneuver the shears as needed. Then I was going to do this before Thanksgiving, because I thought I was hosting. So a last minute invitation kept the bird in the deep freeze. Christmas came and we went away, so now New Year’s was upon us and I figured if it was gonna happen it was gonna happen soon. So I invited some people over and did it yesterday. So, I have pictures of the before it went into the oven and the after. I don’t have any in between because my hands were sticky and slimy! Next time I’ll set the camera up on a time lapse so you can see it step by step, because I will definitely be doing this again! Here’s Aunt Martha showing you how it’s done instead. 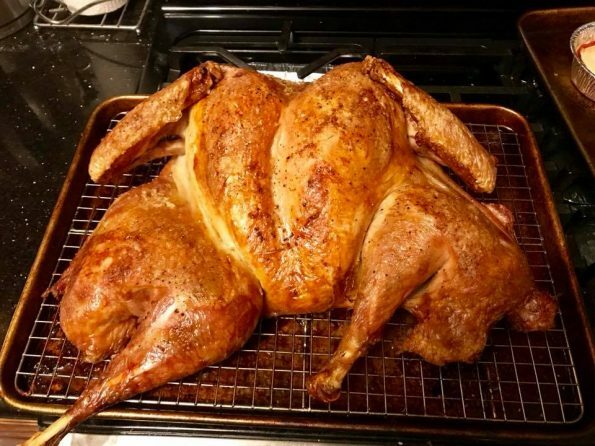 Some have called this turkey “seductive”. View at your own risk. Make sure the turkey is COMPLETELY DEFROSTED before you start the process. Olive oil, butter, margarine, or anything you’d like to use to oil the bird up. Kosher salt, pepper, and other spices to taste. Take out the giblets, neckbones, and anything else they shove up the turkey’s you-know-what. Some recipes call for taking out the wishbone but I didn’t and don’t see any ill-effect. With sharp kitchen shears (and the help of a serrated knife), cut on either side of the backbone, using the shears to cut the ribs. Once you have the entire backbone cut out, lay on the sheet pan with the insides facing down. Press down on the breastbone so it lays as flat as possible. Practice that CPR you learned in high school. It’ll come in handy. Slather with butter, margarine, olive oil, or any other fat you would usually use. I used a great lemon-infused olive oil to cover the bird. Generously salt and pepper the outside of the bird. You can use other spices as you’d like, but salt and pepper that bad boy. The salt will help crisp the skin! Roast uncovered at 450 degrees for an hour (I have a convection roast setting on my oven so it took just over an our – start checking then). The turkey needs to be cooked to 165 degrees, check by placing an instant-read thermometer in the thickest part of the thighs. Once it’s reached its temperature, let rest for 20-30 minutes so all the juices settle. You can’t smell it but you wish you could. In her tutorial, Aunt Martha shows how to break down the turkey. I had a hard time with breaking down the thighs, but her instructions are good (of course they’re good, she’s Martha Freaking Stewart). Broken down and ready to eat! Have a Happy New Year and I promise to post more in 2018!